Blue diamonds are an extremely rare gemstone. Reading about auctions or sales of an expensive blue diamond ring have become big news in the jewelry industry. Now you have a chance to own one yourself. This spectacular diamond – “The Jane Seymour” – is named after legendary British and American actress Jane Seymour OBE. You may be wondering what the OBE stands for after Seymour’s name. Jane was awarded the OBE (Officer of the Order of British Empire) in 1999 for her career work in drama. She was quite honored to have this beautiful blue diamond named after her. It’s a 2.08 carat, fancy vivid blue diamond ring in platinum, from the World Of Diamonds Group. Blue diamonds bring big prices at auctions. There was a 10.10 carat diamond rock named the De Beers Millennium Jewel 4. This oval-shaped, fancy vivid blue diamond sold for $31.8 million to become the the most expensive gemstone ever sold at an Asia auction. In November, the 12.03 carat “Blue Moon” diamond was sold in a Sotheby’s auction to a billionaire from Hong Kong. The prices was a staggering $48.4 million. Just last month in Geneva, Switzerland, “The Oppenheimer Blue” was sold for a whopping $57.5 million. Held at a Christie’s auction, it became the most expensive diamond ever sold at an auction. Jane wore the gorgeous ring at a formal dinner event at CÉ LA VI Singapore. The diamond ring represents the movie industry celebrity, who has won an Emmy Award and two Golden Globe Awards. Seymour also has a star on the world famous Hollywood Walk of Fame in California. The ring was the ideal complement to the elegant blue dress that she wore. 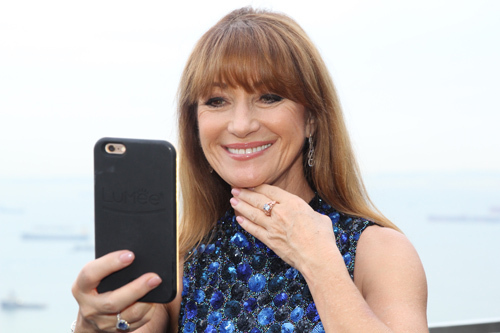 Jane Seymour is starring in a production by British Theatre Playhouse, titled “The Vortex” by Noel Coward. The play will be performed at Jubilee Hall Theatre inside Raffles Hotel in Singapore. Many people don’t realize the final gemstone is so much different than the one found underground. This particular one was not symmetrical in its rough state. But with almost a year of careful work by the world’s finest artisans, the rough diamond was cut into the elegant looking, cushion-cut diamond that exists today. If you are interested in learning more about the spectacular blue diamond ring, please contact us today. We have connections around the world covering the gemstone industry. Return again soon to follow our popular luxury blog. We enjoy sharing incredible luxury jewelry stories with our loyal readers.